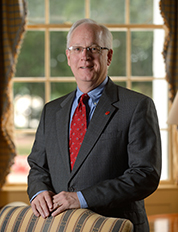 Perry Sansing serves as special assistant to the chancellor for governmental affairs. He is the university’s designated liaison to the Mississippi Legislature and works with elected and appointed officials throughout the state. He also works closely with elected and appointed officials in Oxford and Lafayette County. Before joining Ole Miss, Sansing worked at Mississippi University for Women as assistant to the president and university counsel. He also served as legislative liaison there. Sansing was a member of two Jackson, Mississippi, law firms, Brunini, Grantham, Grower & Hewes and Adams & Reese, before moving into higher education. Sansing earned a bachelor of arts in history and political science and a juris doctorate from the University of Mississippi. He and his wife, Jeannie (B.A. ’82, J.D. ’85) have two daughters, Kimberly Molteni (B.A. ’14) and Lizzie, a senior at Ole Miss.